The University of Maryland Center for Environmental Science (UMCES) and Maryland Department of Natural Resources have been named one of five winners of a $10,000 Stage 1 Prize in the U.S. Environmental Protection Agency’s national Nutrient Sensor Action Challenge. UMCES and Maryland Department of Natural Resources worked together to detail a plan for using newly developed nutrient sensors to explore questions related to the infilling of Conowingo Dam and how storm events will impact water quality in the Chesapeake Bay. The project would place two sensors in the upper Chesapeake Bay to provide data on the speed and extent of nutrient pulses into the bay during storm events. This can help validate models for Chesapeake Bay restoration and give insight into the effect these nutrients—nitrogen and phosphorous—will have on algal blooms and dead zones in the estuary. The Nutrient Sensor Action Challenge is a technology-accelerating water quality challenge from a coalition of federal agencies to demonstrate how nutrient sensors can be used by states and local communities to help manage nutrient pollution. The challenge called for demonstrations showing the effective use of low-cost sensors and innovative partnerships to pilot the sensors and show how collected data and information can be part of state and local decision-making. Teams nationwide submitted action plans detailing how they intend to deploy and use sensors to meet challenge goals. The five winning Stage 1 teams, including the UMCES-Department of Natural Resources project, will compete in Stage 2 of the challenge for an opportunity to win a share $100,000 in prizes to fully implement their proposals. Researchers Lora Harris and Jeremy Testa from the University of Maryland Center for Environmental Science’s Chesapeake Biological Laboratory teamed up with Mark Trice and Bruce Michael from the Maryland Department of Natural Resources to develop a plan to monitor the effects of storms and Conowingo Dam inputs on nutrients in the upper Chesapeake Bay. “This project is an ideal example of how Maryland Department of Natural Resources and the University of Maryland Center for Environmental Science work in partnership to seek funding and new tools to address Maryland’s biggest challenges facing the restoration of Chesapeake Bay,” said UMCES President Peter Goodwin. 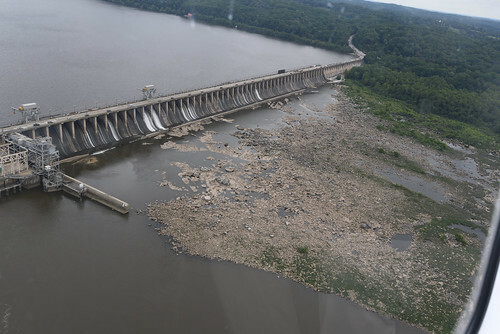 The Conowingo Dam, located on the Susquehanna River where it enters the Chesapeake Bay above Havre de Grace, Maryland, has long been trapping sediment being washed downstream from the Susquehanna watershed. The state has been reassessing the ability of the dam to keep the sediment—and associated nutrients that could potentially contribute to algae blooms and dead zones—from entering the bay. The sensors will be placed at sites in the upper and mid-bay regions—there are already measurements being made at the mouth of the Susquehanna River by the U.S. Geological Survey—to take real-time measurements of levels of nitrate and phosphate during and after storm events. Maryland Department of Natural Resources will deploy and maintain the sensors, provide data management and quality assurance, and make the results available to the public through its Eyes on the Bay water quality website. The University of Maryland Center for Environmental Science will analyze and interpret the data to assess the role of storms and seasonal cycles on nutrient availability in the upper Chesapeake Bay, and work with the department to apply the results to management questions and decisions. The Nutrient Sensor Action Challenge is a collaboration between the U.S. Environmental Protection Agency, U.S. Geological Survey, U.S. Department of Agriculture, National Institute of Standards and Technology and National Oceanic and Atmospheric Administration-led U.S. Integrated Ocean Observing System.